Wanting to cut costs on the energy bill, especially now that temperatures are dropping for the season? Economics may be one reason to seek more sustainable energy sources, but this inventive way to heat the house is also purely fascinating. 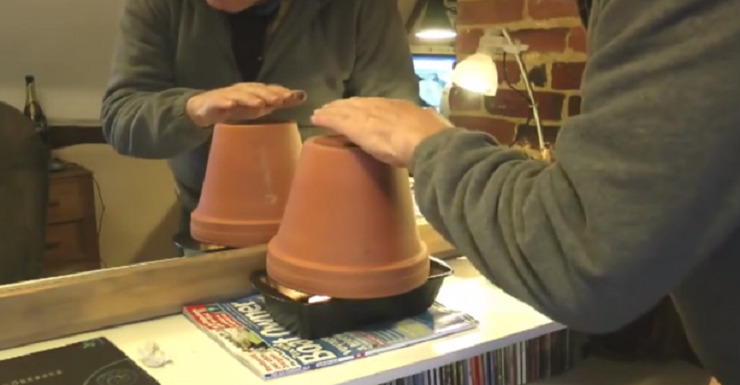 Journalist, YouTuber, and boat owner Dylan Winter created his DIY heater using tea lights and placed inside a bread tin and covered with two ceramic flowerpots. This creative system uses the scientific principles of convection heat transfer and, according to Winter, can heat his home for around 8 hours a day. The tea lights are first put into a bread loaf tin and covered with a small upside-down flower pot. The hole in the top of the upside-down pot is covered with the metal casing leftover from one of the tea lights. Then the pot is covered by a second, larger pot and the hole in the bigger flower pot is left uncovered. This system works because the candles produce gases full of heated particles that are captured and channeled through the pots. As hot gas particles are lighter than the air, they will rise up through the top into the colder area. What will then be caused is the cold air to fall into the warm areas and create a convection current; then heat is transferred from one pot to another, and then out of the hole. One does not need a huge amount of money to invest in this economical heating method, either. Winter began by buying 100 tea lights from Ikea for less than a dollar, a standard loaf tin, and two different sized flower pots. In the video it is shown four candles are used for the heating system. Sharing his invention with the world, Dylan explains that the heat from the candles warms the inside of the smaller flower pot, which becomes an ‘inner core’ that gets ‘very hot’. As explained before, a convection of air is then created between the smaller and larger pots and this heated air comes out of the top of the homemade heater. When asked about his heater, he said: “People have told me that judicious positioning of flowerpots help to make the heating more efficient. I did not believe it but it really does seem to work. Dylan even uses the flowerpot method on his boats to conduct heat. Truly inspiring for those seeking to simplify, be more frugal with their dollar, and leave less waste, perhaps this system will warm many families this year as winter makes itself more present.